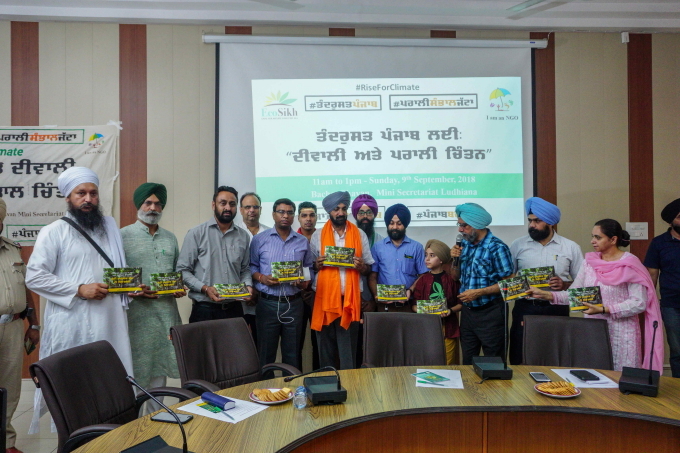 Ludhiana, September 9, 2018: US based NGO, EcoSikh and 'I am an NGO' organized a deliberation on air pollution caused by paddy stubble burning and the episode of fireworks on Diwali, Gurpurabs etc. stating its catastrophic impact on the health of Punjab. The event was organized at Bachat Bhavan Ludhiana under the guidance of Deputy Commissioner of Ludhiana, Pradeep Agarwal. 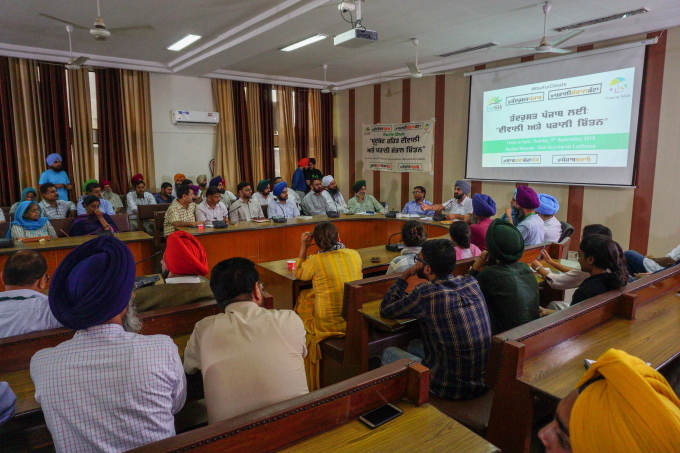 It is to be noted that EcoSikh collaborated with 350.Org which is running worldwide campaign '#Rise for Climate' to address Punjab's local environmental challenges. During this weekend thousands of rallies are being conducted in different countries to demand a pollution free world that puts people and justice before profits and to achieve: a fast, fair and just transition to 100% renewable energy. As per WHO reports 7 million people die every year because of air pollution. The keynote speaker of the event KS Pannu IAS (Secretary Agriculture and Mission Director Tandrust Punjab), informed that the air quality index from October to November touches which indicates severely bad quality air which is primarily due to stubble burning. The government of Punjab has allocated a fund of Rs. 250 crores that is being dispersed in shape of 80% subsidy on happy seeder and other necessary equipment for mulching. With this the farmers of the entire state can convert their stubble into useful organic matter within their farm at a minimal cost. The department is also launching a mobile app, 'iKhetMachine' through which the farmer can locate the nearest available subsidized farm machinery for the purpose. He suggested to the administration to utilize their network and nominate officers at each village to promote this app." Additionally, he informed, "the other source of pollution in Punjab in these months are the traditional brick kilns, which have now been asked to implement the 'zig zag' technology which reduces the emissions to nearly 20% and also reduces the coal consumption by 50%. He emphasized on the role of educational instructions and NGOs to spread awareness." Expressing the criticality of the issue EcoSikh Global President and the guest speaker at the event, Dr. Rajwant Singh stated, "Air quality and clean air is vital for the health of all children and adults. Each year Punjab burns 2.5 crore tonnes of paddy stubble which shoots the PM10 level to severity for an entire month and threatens the health of millions in Punjab and other parts of India. It is critical that this threat is given the top priority and all efforts ought to be directed towards cutting fossil fuels and utilizing the biomass to produce energy and ensuring better air quality." Dr. Akashdeep Singh, Professor in Pulmonary Medicine from DMC, Ludhiana shared the valuable information about the health impacts of stubble burning, "smog effects have started showing up in Nasa satellite pictures from 2002 onwards and have progressively increased over the years leading to many serious health issues in Punjab, Haryana and Delhi." Commenting on the pollution caused by fireworks during Diwali the Ludhiana DC, Pradeep Agarwal stated, "the administration is going to call a meeting of the fireworks vendors to inform them about the high court orders and the administration's policy on sale of crackers. He ensured that very few licenses will be issued this year. He further informed that schools and teachers will be enrolled to motivate students to give up crackers and celebrate Green Diwali." The participating organizations hailed Punjab Government's move for signing the January 2018-MoU with Indian Oil Corporation to open 400 biogas plants to utilize 10 million tonnes of paddy stubble per annum with an investment of Rs 5000 crore. The MoU stated 42 such plants to become operational before 2018 paddy season. 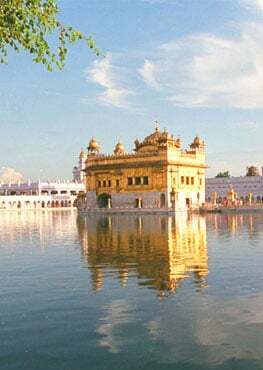 Various NGOs from Ludhiana; RBS Roots, Kheti Virasat Mission, Initiators of Change, Vigaas Foundation, VMAD, Ludhiana Care Ladies Foundation, Sambhav, Lifeline Foundation, Eknoor Sewa Kendar, Ludhiana Peddlers, Sahayak Enviro Group, Basics of Sikhi, Friends for Life, Guru Gobind Singh Study Circle, Senior Citizens Welfare Assoc., AISEC etc. and administration from Punjab Pollution Control Board, Department of Education, Forestry, Excise and Taxation, Education were present at the event.